Thinking of a dream trip to Europe? So are these people. And, they have made their reservations already for travel in 2014. Don’t wait to fulfill your dreams of easy and relaxed travel in Europe. Carol, left and Art, right will join us again this year for a trip, this time, to southern Portugal and southern Spain. May 22 to June 6: Seventh trip for Art and Carol who toured with us most recently in Spain and Portugal in 2013. This time it will be other areas in Portugal and southern Spain with James and Jenean. June 18 to 26: Family of four starting in Paris where they will meet Jenean, continuing on to Strasbourg, Lucerne and Munich. June 28 to July 12: Tour with a family of four starting in London and continuing on to Normandy, Reims and on to Germany where we will retrace some of the steps taken by the parents of two of the members of this group during their time in Germany decades ago. The trip ends in Munich. This will be the first European Focus Private Tour for these Texans. Jenean starts the tour and James meets the group in Normandy. July 16 to 28: Tour with a family of four from Tucson to Germany and Austria, the Czech Republic. This will be Tim’s third tour with European Focus. James will lead this tour. August 5-13: A couple come for their first trip with European Focus in Germany, mainly visiting ancestral villages. 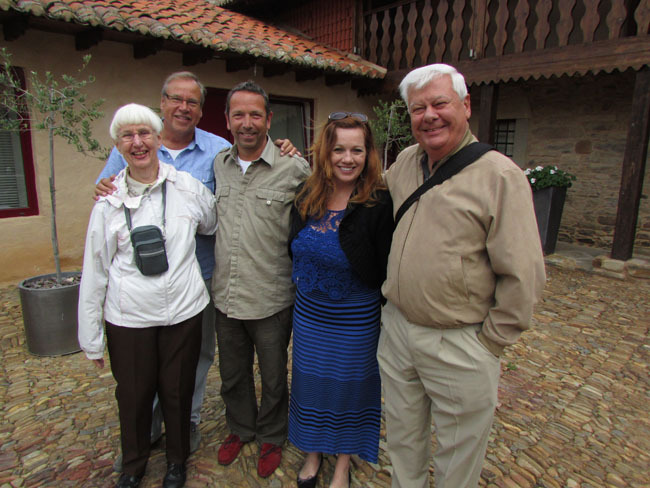 October 4 to 19: Pat and his wife come from Australia for their first tour with European Focus in Germany. Part of the tour will concentrate on family history and part will be slow travel tourism. Pat will meet with relatives in Berlin, who will travel there from Poland. October 20: Mariane C. fulfills a lifelong dream of visiting the village of Appenzell, Switzerland. James will pick her up at her hotel in Lucerne and take her to nearby Appenzell for the day. The timing just works perfectly for this long-awaited journey. She will be ending a river cruise a few days before in Basel. November 23 to December 3: A family of nine comes over to visit some Christmas Markets (starting on Nov 28) and other places of interest which the patriarch of the family enjoyed during his time in the service in the 1960s. This tour will be led by Jenean and James. Available dates are in July, August and September plus the last part of October and first part of November for trips led by James or Jenean. For trips in Germany, Austria and Switzerland we can accommodate you through our partners, ask for available dates. Posted in Austria Tours, Belgium Tours, Croatia Tours, England Tours, Europe Tours, France Tours, Germany Tours, Hungary Tours, Ireland Tours, Italy Tours, Normandy Tours, Norway Tours, Private Tours in Europe, Scotland Tours, Sweden Tours, Switzerland Tours and tagged 2014, available, booking, calendar, christmas, europe, germany, guides, in, market, private, tours.